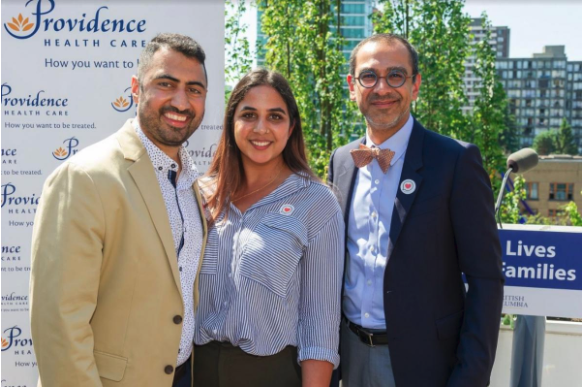 Dr. Sean Virani (R), Head of Cardiology at Providence Health Care, with Marc Bains (L) and his wife, Jessica Bains. On August 8, a special event took place at St. Paul’s Hospital in Vancouver to celebrate a major milestone – 500 heart transplants in British Columbia. Heart transplant recipients, the transplant care team at St. Paul’s Hospital, representatives from BC Transplant and Public Health Services Authority, and Health Minister Adrian Dix, joined together for the occasion. The event also celebrated the 30th anniversary of the transplant program and marked a monumental occasion for the HeartLife Foundation’s co-founder and vice president, Marc Bains. Marc was the guest of honour at the event as he became the 500th heart transplant recipient in BC, in June 2018. Marc lived with heart failure for 10 years and received his healthy heart after 10 months on the transplant wait list. Surgical director of the Cardiac Transplant Program of BC, Dr. Anson Cheung, performed the surgery which took place 30 years after the very first heart transplant procedure was performed in the province. “I feel grateful to be part of this milestone. That moment when the newly transplanted heart begins to beat is something I never get tired of,” said Dr. Anson Cheung in a Providence Health Care News (PHC News) release. Lifestyle changes and medical interventions allowed Marc to come off the heart transplant wait list and eventually establish the HeartLife Foundation with Jillianne Code, a two-time transplant survivor. Then in 2017, Marc’s heart failure began to worsen, and he was put back on the heart transplant list. "There were points where I thought I might not make it, but needless to say I always seemed to bounce back. I was ready for the heart, I was ready for the transplant and to move on to the next stage,” Marc told On The Coast's Gloria Macarenko. Almost three months after the transplant surgery, Marc is looking forward to getting back to work, driving, and living his life to the fullest. Over 1.2 million people living in BC have registered for the Organ Donor Registry, and more than 600 British Columbians are on the wait list for an organ transplant, according to a release from Providence Health Care. Speaking to CBC News, Marc said: “I just want everyone to know that it's easy to become an organ donor. It's fast, it's simple and you could save a life." You can find out more about becoming a donor by visiting BC Transplant.